I’m helping a close friend, a high powered attorney, turn his health and diet around so he can lose 30 pounds and hopefully avoid back surgery. I have put him on a 30-Day Vegan Challenge. Before I show you what I found in his refrigerator let me start by telling you about what we did. First, I started by introducing a healthy breakfast because he so often runs out the door without eating any and that is not good for anyone! Your brain and body needs the right kind of fuel to get you through the day! And we all know that if you aren’t eating, then your body just stores what you later eat as fat, thinking that you’re “starving” and on a “diet”! Personally, I’m a huge fan of Steel Cut Oats from Trader Joes. I make up a large batch (6-8 portions) every week, saving it in glass containers, reheating a portion for a minute in the microwave, and then adding an organic banana and a few walnuts on top. Otherwise, I just have a banana and some fresh fruit! Perfect time right now, since so many delicious fruits are in season! Then we discussed lunch options. Here’s a few samples of what we’ve made together so far. 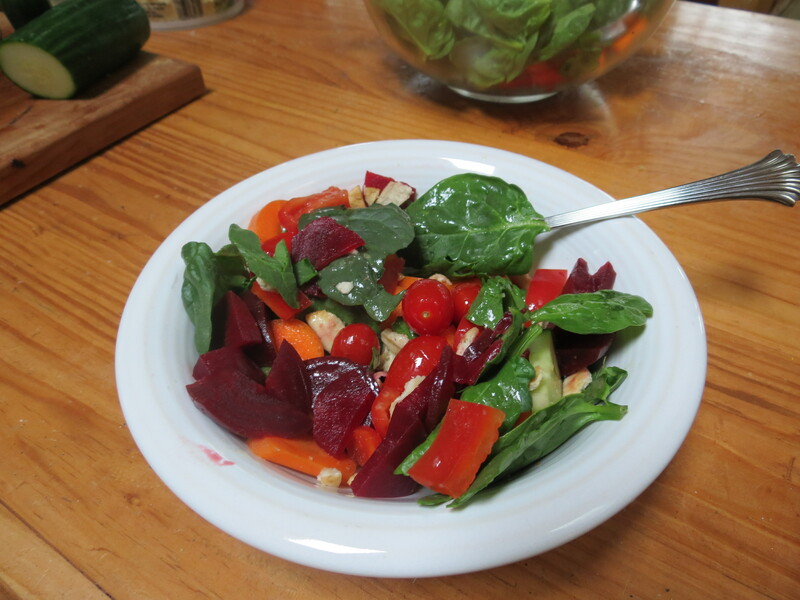 This is an all organic salad with spinach, tomatoes, red bell pepper, carrots, cucumber, and beets. 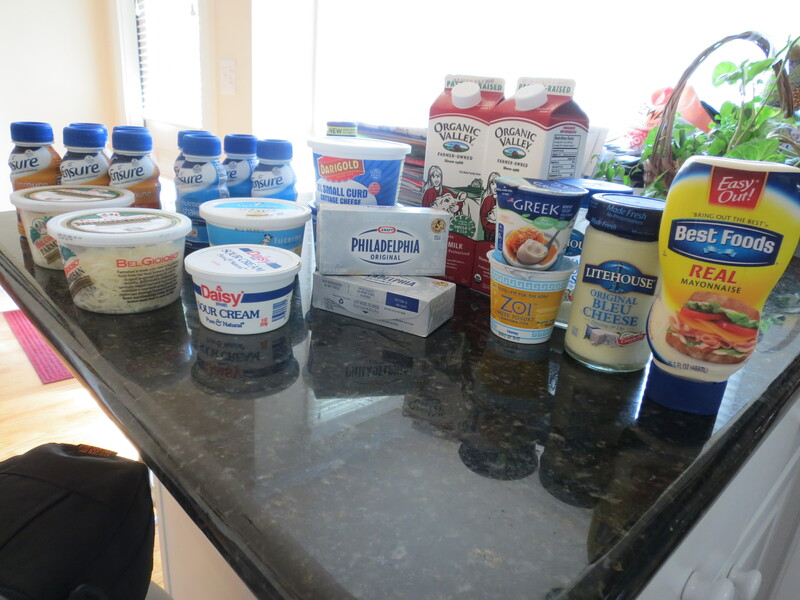 Dairy Products Up the Wazoo! 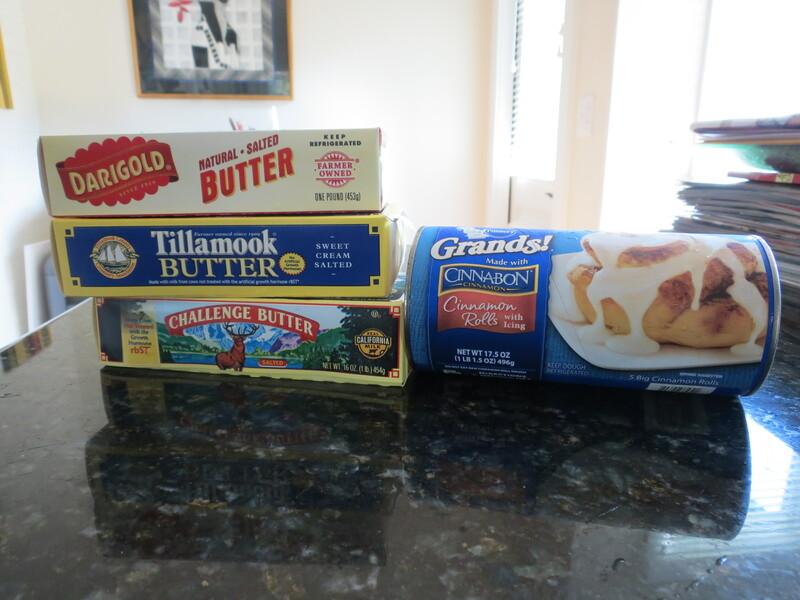 How much butter does one person need? I say none, but if you must there’s Earth Balance Butter! My friend has switched to hummus instead of butter! This is HUGE! A year ago, you would never have thought this man would have made this type of change, but he’s making it and I am very proud of all his efforts! In exchange, he has promised that he’s going to keep a “food journal”, writing down what he’s eating and also commenting on how he feels while making this shift! I’m looking forward to posting what he has to say about it! This week he called and invited me out to lunch…hold your breath folks…at a Steak House! BUT my friend knew the vegan options on the menu because [applause] he had ordered them before! SO, until next time… Enjoy your weekend! Congrats with your friend’s new transition to vegan food! 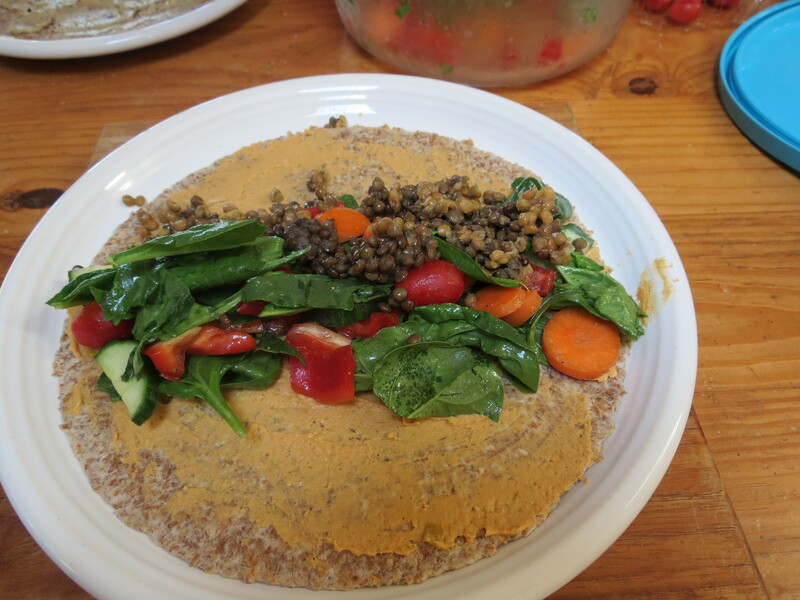 I love hummus, it’s filling and delicious! You can also use tahini in a lot of sauces, including the cilantro-tahini sauce I made on my blog (it was a huge hit for meat eaters). Thanks for the tip! Sounds delicious! 🙂 I will tell him Congrats! What a great decision he made!! I am sure it would also be helpful to go thru options at his favorite take out and restaurants, although i’m not sure anyone could convince me to go to a steakhouse….yikes! Thanks Ttrockwood! Yes, he’s made a wise decision for his health! I appreciate your comment because it’s inspiring me to write a new post about this issue. Hope you won’t mind if I use your comment as the starting point. that I could see – eating a steak. And thankfully, I couldn’t smell it either! Anyway, I will save my longer response & thoughts to your comment for a post. And no, his fridge did not smell horribly. Trust me, his house cleaner would have taken care of it if that had been the case. They were all unopened as well. I really appreciate your comment! I’d encourage you to read an older post called “Vegans in Stride” – an interview I did a while back! Of course you can use my comment for a future post! I’m relieved for you that the steakhouse experience wasn’t horrible- almost all of my friends are omni so i’ve had some awkward meals, however i always make positive comments about the “delicious” and “so fresh” and “tempting” non meat options on the menu before we order, hahahaha. Sometimes it works!